Da Lat is a great weekend destination for those wishing to escape the hustle and bustle, and most importantly the swelter of Ho Chi Minh City – we can assure you the colonials did just the same. 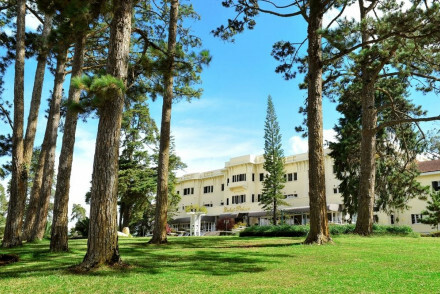 The best places to stay in Da Lat range from authentic French colonial, to secluded luxury. Da Lat is quite unlike anywhere else you’ll visit in Vietnam – stunning countryside is filled with lakes, waterfalls and evergreen forests. Its local products – beautiful silks, flowers and fresh produce – are sold all over the country. It has a French feel, which is underlined by a radio mast shaped like the Eiffel Tower and the many local artists’ fondness for wearing berets. A few ethnic minorities, including the Lat and the Koho, live in the surrounding hills and you can visit a number of rural villages on local tours. In days gone by the Da Lat area was famous for hunting and a 1950s brochure boasted that ‘a two hour drive from town leads to game-rich areas abounding in deer, roe, peacocks, black bear, panthers, tigers, and elephants’. These days the area is less popular with the hunters and more with the honeymooners. An overwhelming number of visitors to the town are Vietnamese tourists and it is undoubtedly the country’s favourite honeymoon spot. Though there are few really great accommodation options, our two recommendations for the best places to stay in Da Lat are full of character and charm. The Ana Mandara Villas are authentically preserved French villas perched on a mountainside. Rooms are French colonial in style, plus there's a pampering spa and excellent restaurant. The Da Lat Palace is brilliantly old-school and looks over the Xuan Huong Lake in town. Its central location means everything is close by. Still undecided? Browse our pick of the best places to stay in Da Lat, expand your search to include all our Vietnam collections, or contact one of our friendly gurus for advice. 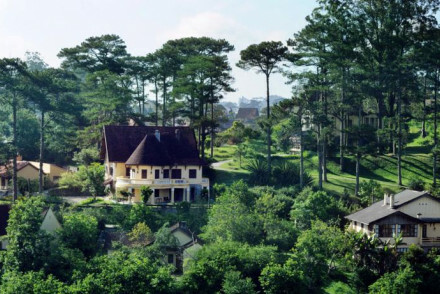 A collection of villas dotted amidst the surrounding Da Lat hills, boasting stunning views. Decorated in a French colonial style rooms feature capacious four posters, antique furnishings and roll-top tubs with open fire places. Gourmet and private dining, plus a spa, completes the package. A unique converted palace set in five acres of gardens, overlooking Xuan Huong Lake. Traditional rooms with fireplaces, large beds and fine artwork throughout. The decor evokes a glamorous 1920's French colonial vibe as does the menu. Elegance throughout. Sights nearby - Located just 300m from Bao Dai Palace.